The Temple Mount is an elevated plateau located in Jerusalem's Old City. It is the site of Mt. Moriah where Abraham was to sacrifice Isaac and the location of the Jewish Temple and ark of the covenant. The site located above the city of David was the site of the Solomonic Temple built around 950BC which was destroyed by Nebuchadnezzar in 586 BC. The plateau was expanded by Herod the Great in the building of the Temple which became known as the Herodian Temple and was the Temple that Christ would have seen. The only remains from this Temple are the retaining walls of the artificial plateau including the most revered site in Judaism, the Western (Wailing) Wall. The site now is primarily a Muslim holy site called Haram Es Sharif, the Noble Sanctuary. 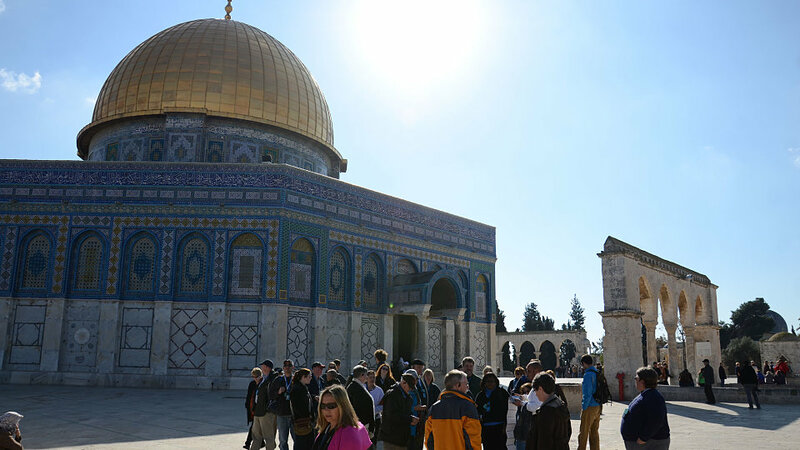 The Dome of the Rock and the Al Aqsa Mosque are the dominant structures on the Temple Mount, which has been governed by the Waqf, the Supreme Muslim Religious Council, since the 12th century. The Temple Mount is currently open during certain parts of the day. Separate security is necessary to enter and Bibles are not allowed. 14: And Abraham called the name of that place Jehovah-jireh: as it is said to this day, In the mount of the LORD it shall be seen. The Temple Mount was the location of the Jewish Temple and thus the seat of God. Long before that Abraham was led of the Lord to bring Isaac here to Mt. Moriah, and as instructed by God to offer Isaac as a sacrifice. Abraham was obedient to God's command and took Isaac to be offered. However, as Abraham was to kill Isaac the Lord provided a ram as an acceptable sacrifice. Centuries later and nearby, God would again provide, but this time it was His Son who was the sacrifice for the sins of those who believe on Him. Abraham would refer to God at this place as Jehovah Jireh, or the Lord will provide. Truly the Lord provides all that is needed by the Christian on this earth as seen here.